Video: Hollywood Live: Tina Alexis Allen. Video: AfterBuzz TV: Tina Alexis Allen. Video: Secrets of a Holy Father: Tina Alexis Allen. Tina Alexis Allen is a GLAAD Award-nominated actress, producer, scriptwriter, and playwright. 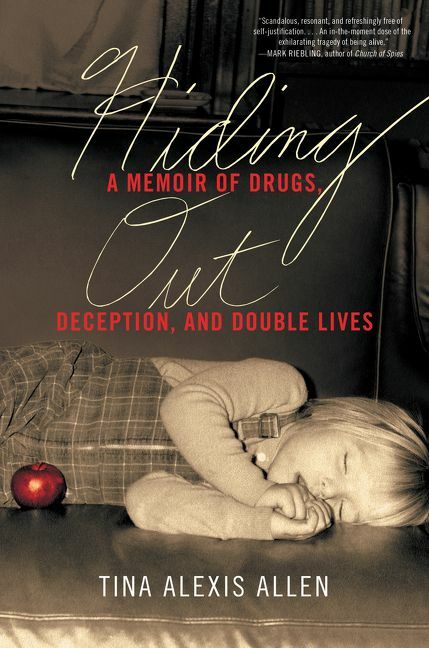 In 2018, Allen’s memoir, Hiding Out: A Memoir of Drugs, Deception, and Double Lives (Dey Street Books) debuts. Allen’s audacious memoir unravels her privileged suburban Catholic upbringing that was shaped by her formidable father—a man whose strict religious devotion and dedication to his large family hid his true nature and a life defined by deep secrets and dangerous lies. A riveting and cinematic true tale stranger and twistier than fiction, Hiding Out is an astonishing story of self-discovery, family, secrets, and the power of the truth to set us free. Allen wrote and performed her critically acclaimed solo show, “Secrets of a Holy Father”, in New York and Los Angeles. Based on her own life, Allen yearned to understand the complicated and highly secretive double life of her father. By transforming herself into him, she took her father’s journey exploring the universal themes of family betrayal, redemption and forgiveness in a tour-de-force performance. In Los Angeles, she performed a 12-character one-woman show, “Irresistible”, lauded by critics as rivaling the work of Lily Tomlin. For her work in “The Break-Up Notebook”, Allen was nominated for a GLAAD award alongside Jane Lynch. In addition, she starred in and produced the Slamdance Jury Prize film “Phantom Pain, and played opposite Theresa Russell in the 2014 feature film, “Moving Mountains”. As a break-out star on WGN’s hit series “Outsiders,” Allen most recently starred as Shurn, a force to be reckoned with in the clash-of-cultures drama rooted in coal mining Kentucky. With Oscar-nominated actor Paul Giamatti on board as an executive producer, Allen acted alongside David Morse (“Treme,” “Hurt Locker”) and Ryan Hurst (“Sons of Anarchy,” “Bates Motel”). Allen resides in New York and Los Angeles. "Reaching Out was lucky enough to have Tina join us for our annual Out Women in Business Conference. While the room is full of women who all identify as part of the LGBTQ community, they come from all different background, life experiences, and career stages - so finding content that universally connects can be difficult. Tina was the rare speaker who was able to make that universal connection and captivated the room as she shared her personal journey. It was the perfect combination of modern themes with a personal touch told in a style that left them them wanting to hear more as they went on to their breaks."